Chatted with Jennifer Lawrence, who is about to become a HUGE star through her role as Katniss Everdeen in the long-awaited and highly-anticipated The Hunger Games, and I have to say she is one of the funniest, most down-to-earth stars-to-be I have run across in this business. 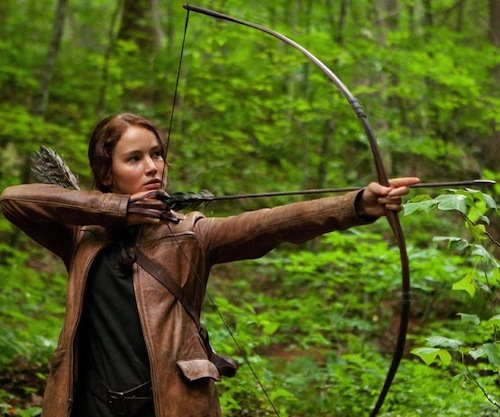 As every teenager—and most of their mums— knows, The Hunger Games is a movie based on the first of three books by Suzanne Collins and set some time in the future, when every year a boy and a girl from each of twelve districts are pitted against each other in a brutal game of survival where they are forced to kill each other in a televised death match until only one remains as the victor. FOOTNOTE: I saw The Hunger Games a couple of weeks ago but I’m not allowed to review it or write about it because Lionsgate Studios have slapped an embargo on anything being written until March 20, just before the movie is released. Could it be they are worried about bad advance reviews?